It’s sunny, it’s spring, it’s… still kind of grey-ish in Estonia. It’s the perfect time for guerilla gardening! 1. Find some paper and soak it! Take old newspapers, used paper or plain white paper, and tear it up into pieces about 2 x 2 cm small. Soak the paper in water for about 30 min. The thinner the paper is, the shorter time you need to soak it. It should easily fall apart when you rub it between your fingers. If you use newspaper or used paper, the ink on the pages will dye the paper. It is not a problem, as the paper is meant to fall apart in the nature anyway. If you want to colour your seedbombs a specific colour, just use plain white paper. 2. Process the paper into pulp! Put the soaked paper pieces into a mixer (with knives) and mix it until you get paper pulp. Its consistency should remind you of oatmeal porridge. Go easy on your mixer – mix the pulp in small batches, step by step. 3. Add colour into the mix! We recommend either aquarelle colours or gouache (tempera). They are water-dispersable and envireonment-friendly. 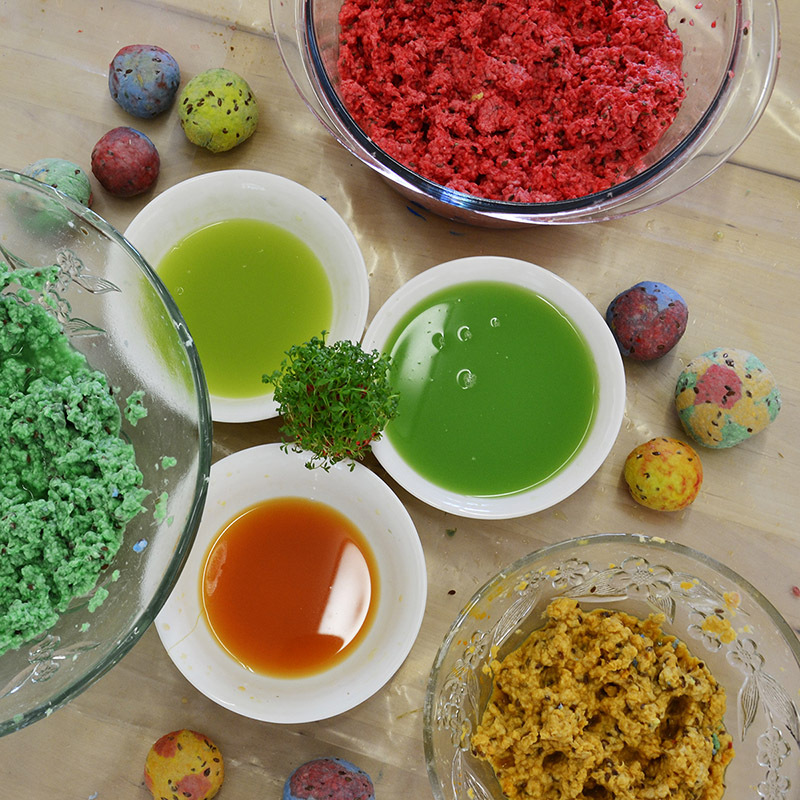 Separate the pulp into several bowls, so you can combine colours later on. 4. Add seeds into the mix! Flax. It’s a strong seed, grows quickly and easily. Adorably small blue flowers will bloom in 2-3 months. Labora seed bombs are made with flax seeds. Plus, they are available in most grocery stores. Cress salad. If you want to keep he seed bomb at home and eat it later, it’s the perfect option. 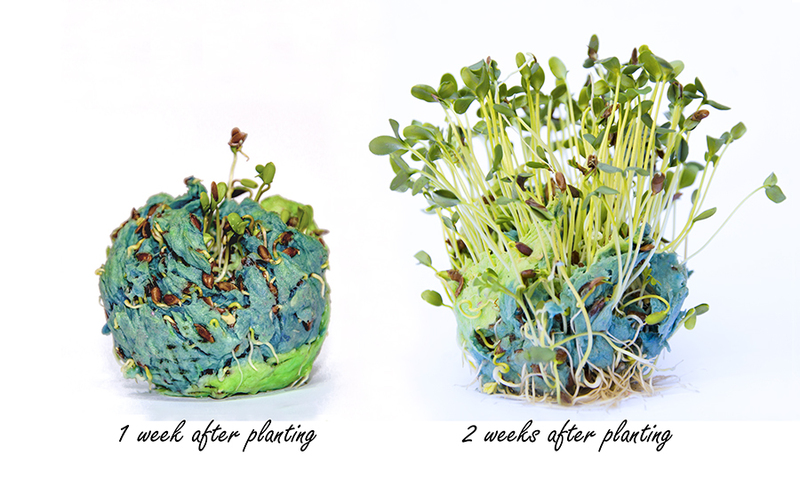 Cress salad grows quickly and easily as well. In about 2 weeks time you can harvest it and sprinkle it as garnish on your morning toast. Our chef’s recommendation! Wild flower seeds. The ones domestic to your country are the best. They are used to growing wildly, so they don’t need much attention. They might not be as grand as their cultivated cousins when blooming, but they will blend in and decorate the abandoned city corners just as well. 5. Form the seed bombs! 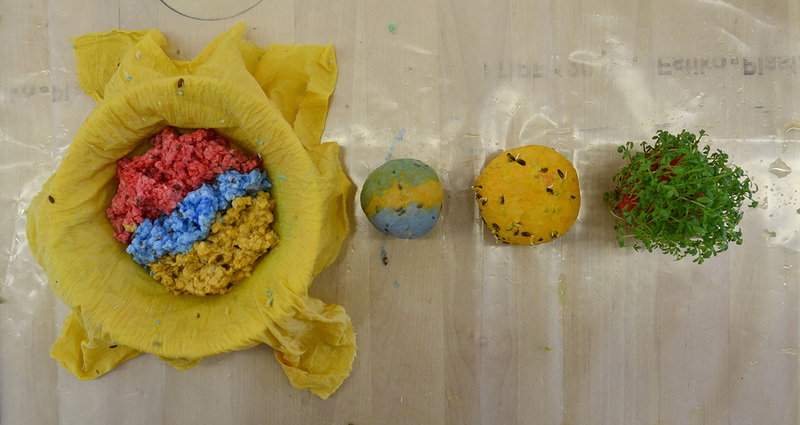 There are many different ways to make a seed bomb. Some recommend using ice cube forms – why not, the results are lovely. We will show you how we do it – to get a nice round ball with a bit of a twist. 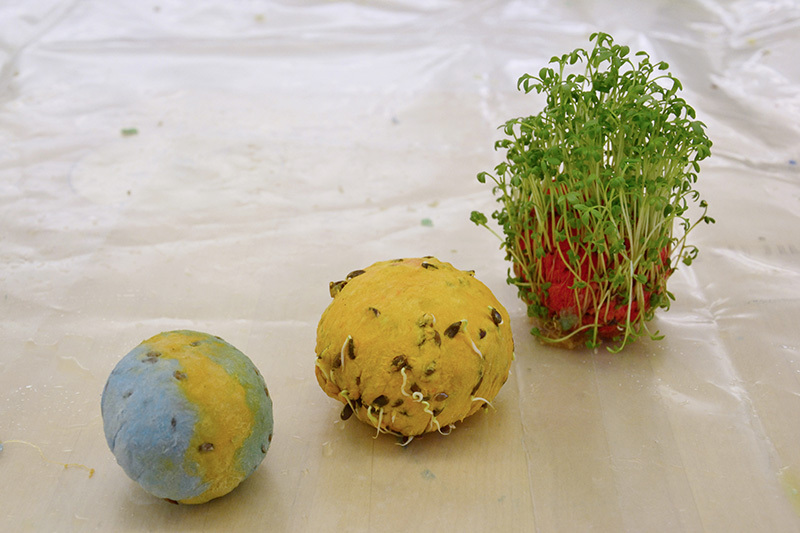 The benefit of this method is that it drains as much water as possible from the seed bomb. (This is very important if you want to dry them to use later on.) Combine colours, try making small patterns, have fun! This might be the tricky part. If you do not want to go and seed bomb the city immediately – which we recommend – you will have to dry your seed bombs. The best way to do this is to put them on a warm radiator. Start drying them as soon as possible after making, so the seeds do not start germinating. 7. Seed bomb the city! Now you are ready for some extra fun. Go around the city, find corners which need some green colour, and leave your seedbomb there. Throw it into your neighbour’s unkept garden. Throw it anywhere! It is good to soak the seed bombs ahead in case you are planning to throw them somewhere out of reach. Or they will just have to wait for a spring storm to soak them and bring the seed to life.